Sondheim’s musical Into the Woods sees your classic fairy tales twisted like never before, but even more so in The Cockpit’s new production where the well-known characters have been given a 21st Century makeover. This is an enjoyable adaptation full of talent but sadly the modern-day twist just lost it’s way. Into the Woods makes a point about learning adult responsibility – how your actions and impulsive desires have consequences. Making this statement through the medium of a child’s fairy tale really drives the point home, so here, when that storytelling device is altered, the message of the piece slightly loses it’s punch. Despite this I went in with an open mind but the vision isn’t always well-executed. If you’re going to change a core part of the show then your new vision needs to be just as brash and powerful. The modern stereotypes could be bigger, more caricatures to help that message hit home, but you are left guessing with some characters where the modern alternative just doesn’t translate. Some depictions are on point – Jack’s dysfunctional ‘Jeremy Kyle’ family really fit their part in the story and Madeleine MacMahon plays Jack’s mother to perfection. However the princes for example left me wanting more over the top, ridiculous posh boy arrogance. I wish (forgive the pun) that director Tim McArthur had drawn a little more from some of his cast members just to reinforce the stereotypes that little bit further. Some fans may appreciate an alternative take on the popular musical and it certainly doesn’t ruin the piece entirely. I admit I struggle to enjoy Sondheim’s music at times but the cast and band really do justice to a difficult score – it’s beautifully sung and expertly played throughout thanks to Aaron Clingham’s musical direction. Unfortunately the sound lets them down at points. The cast use microphones but they are unreliable and in such a small space I questioned the need for them – with the band above your heads they hardly drown out the action. As mentioned above, Madeleine MacMahon portrays the twist on Jack’s Mother superbly, throwing herself into the character with unforgiving confidence. Jordan Michael Todd’s enchanting narration was one of my favourite things about the piece and when his character disappears (cough spoilers) in act two you do miss him guiding you through the tale. I loved Abigail Carter-Simpson’s Cinderella; with a gorgeous tone she carried her parts of the show with ease. 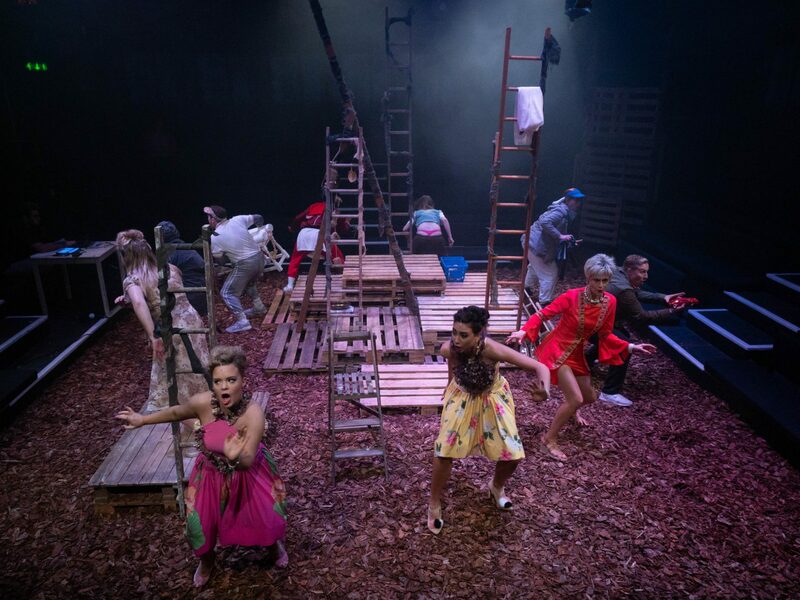 The set is clever for a small space, set in the round and decked with wooden crates and ladders. The wood chip floor creates a woodland aroma from the moment you step foot into the auditorium and the four corners lend themselves perfectly to different homes and settings in the show. You can’t help but feel immersed in the production! The modern-day take may not work for me but others may disagree so don’t be put off. Go discover this show for yourself – see this talented team making Sondheim’s classic musical hit sound fresh and exciting in a versatile space that I already want to visit again! Catch Into The Woods at The Cockpit in Marylebone until Sunday 24th June. Tickets available here for just £24. DID YOU LIKE THIS POST? FOLLOW ME ON SOCIAL SO YOU CAN SEE MORE STAGEY STUFF!